A traditional winter pudding with a tasty twist for those days when only sweet will do. 1. Place the dairy-free coconut drink, rice and vanilla powder in a heavy-based saucepan and cook gently for 45 minutes, stirring regularly until the milk has been absorbed and the rice is soft. 2. Thinly slice the mangoes and whizz half until smooth. 3. Toast the coconut in a small non-stick frying pan for 2-3 minutes until golden. 4. 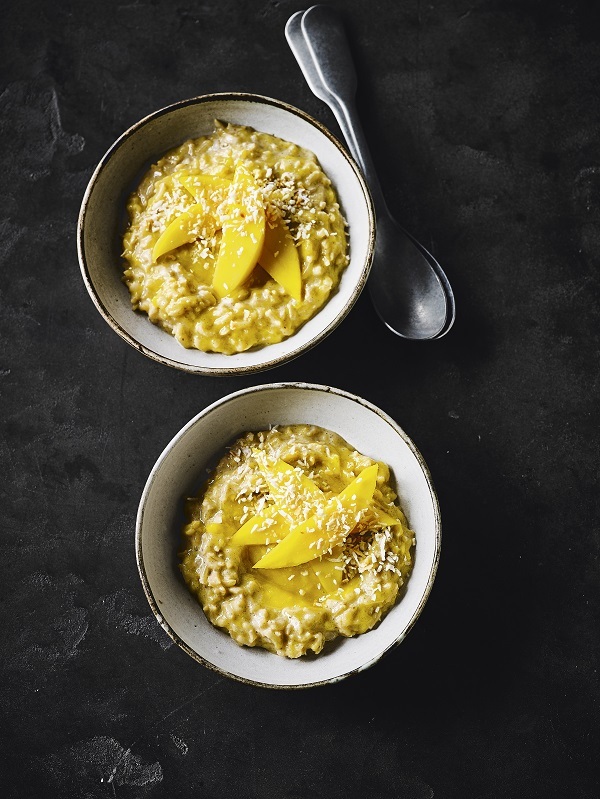 Ripple the puréed mango through the rice pudding and spoon into small bowls. Scatter over the remaining mango pieces and the toasted coconut and serve. Cook’s tip: For a very soft pudding, add more liquid and cook for up to an hour. This works equally well served chilled. Allow the rice pudding to cool then chill until ready to assemble.